H.P. LOVECRAFT's "Dream Quest of Unknown Kadath" full length indie movie soundtrack. Award winning songwriter, Land of the Blind's Cyoakha Grace O'Manion creates a dark underworldly swirling surreal gothic nightmare that gamers love too. CYOAKHA GRACE O'MANION, composer of the soundtrack for the animated H.P. LOVECRAFT movie, DREAM QUEST OF THE UNKNOWN KADATH, announces that the CD, UNKNOWN MUSIC FROM DREAM QUEST FOR KADATH is now available on CD Baby. CYO, lead singer-songwriter-producer for the beautiful world-trance band LAND OF THE BLIND, took over a year to complete the amazing soundtrack and CD. The director of the movie fell in love with the music of BLIND and asked her to create the entire soundtrack, (at that time they both thought it was to be a 30 minute short). It ended up being a 96 minute feature film, which debuted at the national LOVECRAFT FILM FESTIVAL, to rave reviews and Cyoakha's haunting music is all the way through the film, setting the mood of Lovecraft's "dreamtime". The director's only request was that the "music sound as if it's from another world". "So there I was", laughs Grace, "96 minutes to create and not one sound should sound normal in any way. And you can't cheat and go the 2001 direction, like most sci-fi soundtracks, all avant progressive keyboards, because the novel is set in the 30s!. So I warped sounds, ran things backwards, did everything creative and bizarre I could think of. The result is this CD, UKNOWN MUSIC, 19 tracks of avant, dark, haunting, scary, dreamy, nightmarish and otherworldly music. For those filmgoers that loved the soundtrack, each of the snippets of sounds heard in the movie are actually full length works and all are included in this soundtrack. Many of San Francisco's best world musicians also added their talents to this stellar CD. For Lovers of avant music, progressive music, beautiful female vocals, dark-goth and all Lovecraft fans. Cyoakha invites you to listen to LAND OF THE BLIND's two award-winning CD's, ORDINARY MAGIC and OUT OF CHAOS also on CDBABY! As I mentioned in my review of the animated adaptation of H.P. 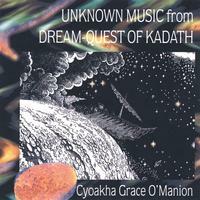 Lovecraft’s The Dream-Quest of Unknown Kadath, the score by Cyoakha Grace O’Manion of the band Land of the Blind truly helped make the movie, appropriately titled Unknown Music from Dream-Quest of Kadath. I’m no music expert. I don’t know the proper musical terms or instrument names or what not. All I can tell you is what I like and how it might work in a gaming context. Interestingly, the result feels in many ways more appropriate as background music for a traditional Call of Cthulhu adventure than it does for a Dreamlands jaunt. Which is funny, considering how perfectly it fit the movie based on the seminal Dreamlands novella. The CD begins with 1. “The City of Dreams,” a lush track featuring Cyoakha’s hauntingly ethereal vocal instrumentation accompanied by peaceful wind chimes, burbling fountains, and birdsong. These elements easily make it the most purely dreamlike track, ideal not only for Dreamlands adventures, but also for any roleplaying adventure involving fairies or other elusive, idyllic wonders. 3. “Descent,” with its reverberating strains and echoing wails, gave me the feeling of trudging through vast, ancient chambers or caverns – perfect music for daring the Mines of Moria or similar subterranean realms. 4. The eerie, lethargic, and sensual “Sailing Over Sorrow” speaks to me of impossibly beautiful Gothic vampires slinking gracefully down benighted Victorian streets or dark castle stairways. 6. With its long, low, midnight-deep strains, bubbling swamp-like effects, and ghostly distant singing, “Boneyard Fear” makes a fine accompaniment to a witch coven’s Black Sabbath. 7. “Nightgaunts,” by contrast, picks up the tempo with a sense of quickly approaching danger – like, say a flock of Nightgaunts. When the inevitable fleeing from the monster begins in your horror game, break this one out for the chase music. 8. Heavy breathing, creaking timbers, and an ice-cold melody make “Endless Crawl” ideal for any adventure involving a haunted house or (especially) a ghost ship. 10.…and the pulsating darkness and ululating calls of “Nightmare 102” may hint at the unspeakable outcome. 13. In a total non sequitur, “Keep Working” features tribal drums and quiet, cruel laughter, but its most prominent aspect has to be the tinny B-movie alien voice urging the listener to (as the title suggests) “Keep working… Don’t give up… What is important is that you work… We are asking you to concentrate on the job… Nothing is more important than the job…” I can’t imagine using this one for a traditional horror game, but for a “Brave New World” sort of setting like Paranoia at its darkest, I can’t imagine not using it. 15. The eerie lullaby of “De Largo” – including a child’s music box – and the ghostly, elusive vocals of “So Deep” earn this pair a place in any haunted mansion. 16. More than any other track, “Backwards in Time” begs for use in a traditional Call of Cthulhu game. A musical funhouse mirror warps carnival tunes and 1920s vocals to produce a disturbing slippage from comfortable reality. This should be playing on any stereo when rookie Roaring Twenties investigators get their first taste of the Mythos. 17. A disorienting staccato keyboard starts off “Ride ‘till the End,” slowly fading into a quiet melding of previous tracks on the CD. The result feels akin to wandering a fog-filled House of Mirrors. If you want to emphasize that the characters in your game are well and truly lost, this one should get your musical point across quite nicely. 18. Despite Cyoakha’s stated intention of avoiding anything “2001-keyboardy,” the “spacey” keyboards and echoing wordless vocals that seem to stretch on into infinity would have made “Feels Like Dying” a perfect fit for the final surreal moments of 2001: A Space Odyssey. This is a good thing in my book, however – especially if your adventure has a final surreal moment of its own. All I can say is that this unique collection cries out for use alongside any RPG of horror, dark fantasy, or the surreal. And if you enjoy a darkly ethereal sound – some twilight region between goth, ambient, and world music, perhaps – this could be the CD of your dreams.